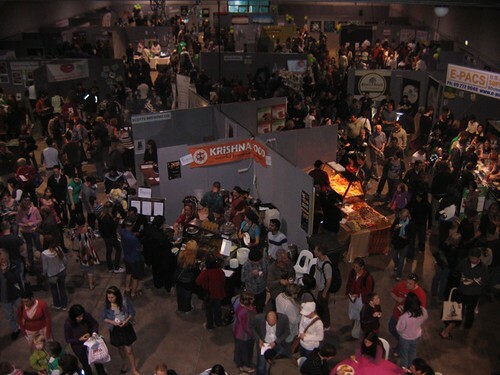 This year’s Vegetarian Food & Lifestyle Festival was the biggest it’s ever been, and was much more vegan-friendly than the last one I went to. The festival was part of the Global Climate Working Bee. We started the day downtown at the Big Bike Fix Up and Get Growing Auckland in the Viaduct, then took the train and cycled to Greenlane where the Vegetarian Festival was being held. Angel Food‘s new products: Spacebar mini sausages (bought a chorizo one for snacking on), liquid smoke (have some at home, excellent for tempeh bacon), vegan caviar (didn’t try, but looked interesting) Follow Angel Food’s Facebook page for more about their new stuff. Smooze frozen coconut milk treats (3 boxes for $10!). I blogged about Smooze a while ago, but hadn’t eaten any in a while. Mango is still my favourite, but pink guava is pretty good. Goodeys Bookstore, which has a big selection of vegan cookbooks – worth checking out when you’re in Newmarket. The bookshop is in the same building as Wise Cicada, which also shared their stand at the festival. Kohu Road. My friend Kat has been raving to me about their icecream for ages, and was sad with me when they launched a dairy-free coconut based icecream that contains eggs. But, their newest thing is a range of sorbets! The chocolate, strawberry and mango flavours are vegan, and I tried the chocolate and mango ones for the first time on Sunday. My favourite kinds of chocolate are super-dark and not very sweet, so I’m often disapponted by frozen chocolate desserts that are (soy)milkey and full of sugar. Kohu Road chocolate sorbet is neither of those things, it’s just like smooth, frozen, dark chocolate. I’m looking forward to eating it again. Moana Park wine from Hawke’s Bay. They produce wine without using animal products for fining, and use either organic or sustainable growing methods for all their grapes. Their Vin Gris was my favourite of the wines I tried. Nuttz fancy gourmet dry-roasted nuts. Lots of their nuts contain honey, but I really like the cinnamon cashews and wood smoked almonds. Bean Supreme, who displayed some new products that they’ll be launching soon. I didn’t note which ones were vegan, but think the lentil and falafel koftas were, at least. Frooze Balls – little bliss ball-style snacks made of dried fruit and nuts, produced by the people behind Revive. Vegan Krishna food – I didn’t try any, but it looked pretty good. Thanks, Vegetarian Society! Looking forward to next year.